Check the availability at La Rosière’s hotels for overnight stays, short breaks or week-long holidays. Flexibility, comfort and quality accommodation in a traditional and welcoming environment! This hotel is located just next to the slopes in the L'Averne area of Les Eucherts, with splendid views across the High Tarenataise valley, The Mont Valaisan and neighbouring peaks. Hotel with ski in an ski out access to the 152 km of the Espace San Bernardo ski resort. Discover its 69 bedrooms and suites, all with mountain view, its H40 restaurant with panoramic terrace and its 420sqm spa. The chalet-hotel’s 10 bedrooms can sleep up to 28 people, with top-quality and personalised guesthouse-style services. The hotel is ideally located close by to the walking paths, the foot of the slopes, with a Japanese Spa for a holiday of relaxation and well being. 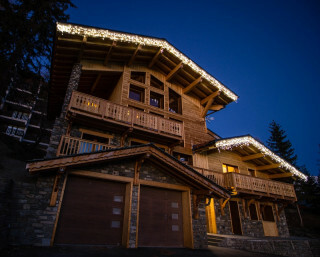 A brand new chalet in La Rosière village, Chalet l’Aiglon can welcome 12 to 14 people into five luxury bedrooms. Our flexible service with half board and B&B options helps you to organise your perfect hassle free holiday. Welcoming chalet hotel with 18 rooms, located within walking distance from the foot of the slopes. Ideal for a holiday with friends or family. In the Petit Saint Bernard Pass, in a building charged with history, Gregory welcomes you and provides accommodation and meals. Staying true to the origins, the Hospice Petit Saint Bernard is open 7 days a week, 24 hours a day from 1st June until 31st Octobre 2018. Dormitory style rooms with 2 to 8 beds.